Mitt Romney deserved a Faye Dunaway Award for his “Make me president! Don’t make me president!” ambivalence. When Mitt was 20 years old, he watched as his father, Michigan governor George Romney, blew his chance at the nomination in 1968 by saying he had been “brainwashed” into supporting the Vietnam war; that gave the far right all they needed to demolish Richard Nixon’s only progressive rival. For Mitt to win the nomination this year—despite his term as governor of Taxachussetts and his creation of the pilot version of Obamacare—is a remarkable accomplishment…. [He] beat back just the sort of “muttonheads,” as he called the rabid right in ’68, who had humiliated his dad…. Anyway, Romney’s nomination has already done something very real for one of the few American institutions he truly seems to care about: the Church of Jesus Christ of Latter Day Saints. He helped to finally establish Mormonism as a legitimate part of the Republican Party hierarchy, not to mention American political history. In fact, Mitt Romney was so riven by conflicting desires that he deserved a Faye Dunaway Award (named for her “She’s my sister! She’s my daughter!” rant in Chinatown) for his “Make me president! Don’t let me be president!” ambivalence. He expressed it passive-aggressively, by allowing himself to be bullied ever farther to the right during the primaries—even as he bullied his opponents personally from still farther right. It made him seem both weak and nasty. And you could see the ambivalence in his body language. When Mitt walks forward, his short, halting steps seem to pull him back, turning a brief trip to the microphone into a parody of a middle-aged white person moon-walking. On stage, during debates, he’d often look on wistfully, almost dreamily, at the other candidates while they spoke, as if he’d be “ecstatic,” as Tagg says, if only somebody like that could win the coveted office. At the first presidential debate, he was suddenly confident and direct, a change-up that seemed to stagger Obama, and I started to doubt his doubt. It began to seem possible (as Mike Tomasky wrote) that maybe it was Obama who didn’t really want to win the election. But it was truly odd the way Romney dropped that hard-charging, moderate CEO act, which worked pretty well, to start wagging on about Benghazi and assorted bupkis. 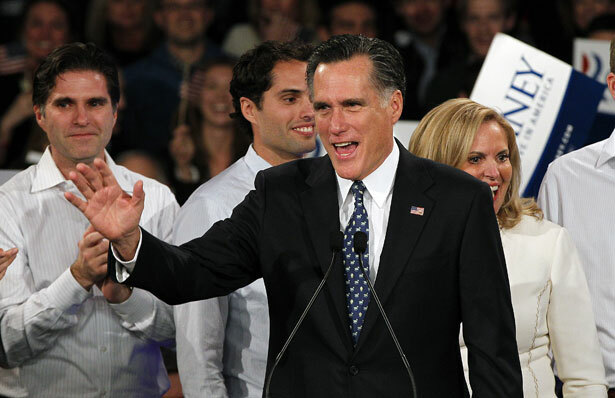 It was almost like the campaign’s revived fortunes scared Mitt into marble-mouthedness. Surely Tagg exaggerates in saying his father “wanted to be president less than anyone I’ve met in my life.” But at the very least we can say that Mitt was deeply, fatefully torn—and that, in retrospect, it was the people around him who had the fire in the belly. While Tagg reveals his father didn't want the presidency, three new senators will be joining Capitol Hill unelected. Read why John Nichols says that's bad.